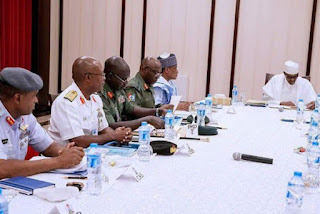 President Muhammadu Buhari is currently meeting with Service Chiefs in his old office at the Presidential Villa, Abuja. 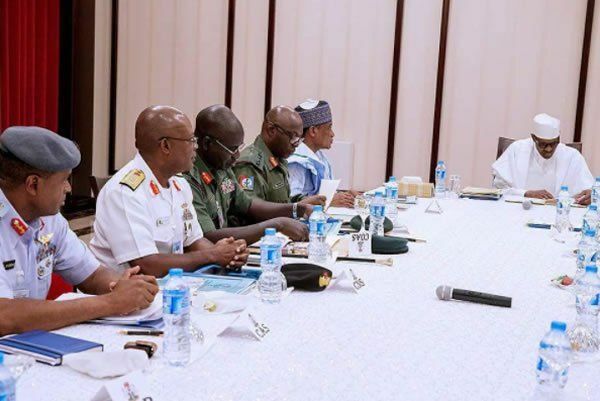 The meeting which is called the Armed Forces Council meeting is said to be the first since the President’s assumption of office. The Service Chiefs, the Minister of Defence, Mansur Dan-Ali, the Permanent Secretary in the Ministry of Defence and a Director are said to be in attendance. Ahmad was reacting to a report that Buhari has been avoiding his Aso Rock office after 81 days. Buhari had some months back vacated his office at the Presidential villa, following destruction caused by rodents upon his return from medical vacation in London.